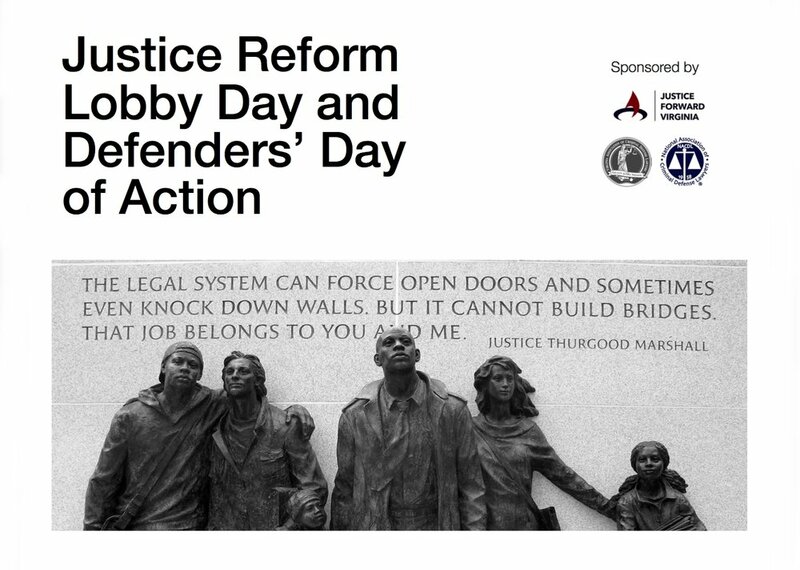 Join Justice Forward Virginia, the National Association of Criminal Defense Lawyers, and the Virginia Association of Criminal Defense Lawyers for our Justice Reform Lobby Day and Defenders’ Day of Action on January 18, 2019 at the Virginia General Assembly in Richmond, VA.
After decades of being stuck in the mud, criminal justice reform has finally gained traction in the Virginia General Assembly. For the second year in a row, momentum is building toward real change. At the top of this year’s agenda appears to be bail reform — ending the practice of locking people up before trial simply because they're too poor to pay their way out of jail. JFV, NACDL and VACDL have joined the call to end cash bail, and we will be discussing the bail reform bills we support with legislators on January 18. Bail reform is just one small step toward the comprehensive change Virginia needs, however, and we intend to make that clear as we speak to lawmakers in Richmond. Along those lines, Justice Forward has published a Justice Reform To-Do List, a short primer on some of the most pressing issues in criminal justice, which is available online here. Some of these issues are the subjects of 2019 legislative proposals. Although justice reform has captured the attention of some Virginia lawmakers, opponents still enjoy a significant advantage in Richmond, just as they do throughout the country. Perhaps the most powerful of the opponents, the Virginia Association of Commonwealth’s Attorneys [VACA], has already signaled its intent to lobby hard for diminishing defendants’ constitutional right to confront their accusers and for expanding the War on Drugs by giving prosecutors discretion to charge defendants in narcotics cases with murder. VACA and its constituent members are also cynically attempting to make regressive policies or meaningless “reforms” look like actual progress, which is a common tactic in Virginia and elsewhere. They’re doing so to score political points, hoping that Virginians and the legislature won’t be able to tell the difference. We’re betting that they will be able to tell the difference — because we are committed to making it so. Our Lobby Day is open to all who care about fixing our broken justice system, whether lawyers or not. We firmly believe that in order to succeed, our efforts must rely on a broad coalition, including people of faith, returning citizens, human needs and human rights organizations, and champions of individual liberty, among many others. That said, public defenders are some of our most passionate and committed advocates, and they are on the front lines of the fight on a daily basis. They also happen to have the day off on January 18, 2018, due to Virginia’s continuing recognition of Lee-Jackson Day. Many defenders instead treat this as an opportunity to advocate for equal justice and racial justice, and for that reason, we give them special acknowledgement. On the same day in 2018, we joined as Defenders for Discovery Reform, and in 2019 we gather again (as a subset of our Lobby Day) for a Defenders’ Day of Action. If you are a defense attorney or otherwise work with court-involved individuals, please also indicate which jurisdictions you serve. We need the foregoing information so we can schedule meetings with your own delegates/senators and assign you to lobbying groups. No prior lobbying experience is required in order to participate. Those who haven’t lobbied legislators before will be assigned to groups with people who have. Prior to January 18, we will conduct a briefing on the substantive reforms and issues that will be the subject of our efforts. The tentative start time on January 18 will be 8:30am, at a location several blocks from the General Assembly in Richmond. Specifics will be provided via email to confirmed participants. URGENT: Stop Trial by Affidavit (SB 1076)!